Instagram skin in a bottle. Finding the perfect foundation can be a painful yet rewarding process. Most of us are constantly on the lookout for a good coverage, long-lasting, pore minimizing yet light foundation with a natural finish, which can be difficult for any brand to achieve. Huda Beauty’s new #FauxFilter foundation has just recently launched and claims to do exactly what we are looking for. Beauty blogger and makeup artist, Huda Kattan, founded her beauty company Huda Beauty in 2010. The Instagram sensation launched the hyped-up foundation in October, along with a face primer and a foundation brush. She launched 30 shades, 10 fewer than Fenty Beauty, and the foundation ranges at about €36 for 35ml in Brown Thomas. Is it worth the hype? After putting this foundation to the test during a normal day at college and drinks afterwards, I can honestly say yes, it is completely worth the hype. Initially, after applying the foundation with a beauty blender, the coverage is unbelievable for just 1 and a half pumps. It does not emphasise pores or look cakey, but instead, it covers any discolouration or imperfections you may have and gives you a ‘glow from within’ look. Although, the foundation does set fast, so try to blend it in the skin soon enough, setting it very lightly with a translucent powder before it sets into any fine lines. It is important to note that the foundation has a subtle floral scent to it which you will either love or hate, depending on personal preference. Since the foundation is so highly pigmented and therefore semi-matte, it’s important for people with dry skin to use a moisturising base. 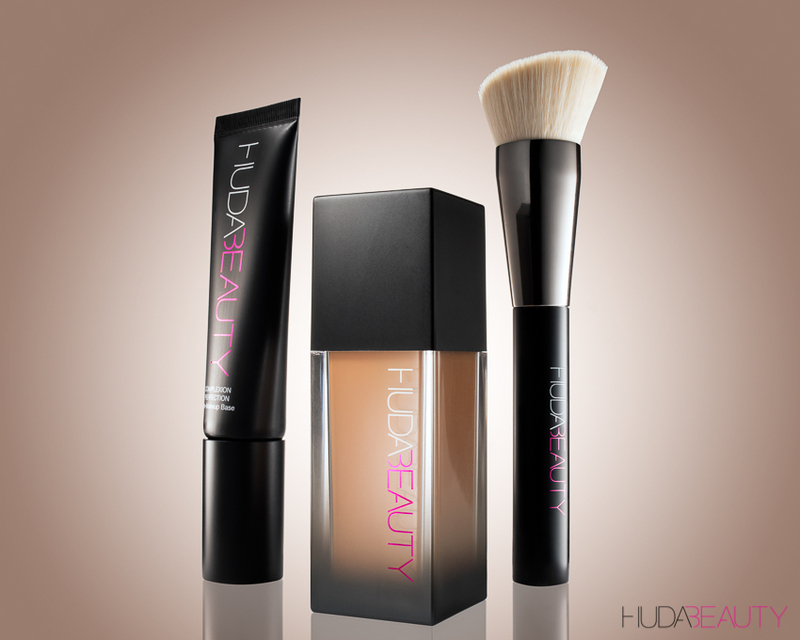 Huda Beauty’s Complexion Perfection primer is a viable option as it is quite moisturising. However, I recommend using your own moisturiser or primer and not to waste your money on this one as I’m not sure that the foundation lasted any longer than when used with any other primer. For oily to combination skin, this foundation is your new holy grail. Although I did get a bit shiny by around 9pm, it was significantly less than a lot of other foundations and still found that it held up very well and did not separate or become blotchy. Though it may seem like there aren’t any drawbacks of this foundation, there is one significant problem that cannot be ignored. The lack of shade ranges for darker skin is a huge setback, particularly after the launch of Fenty Beauty which had a great shade range for darker skin tones. Many beauty influencers on YouTube such as Jackie Aina and Nyma Tang found that the shades and undertones did not work for them at all. In short, the creamy, buttery foundation blends like a dream and gives your complexion the look of an Instagram filter in real life. If you want to splurge on a foundation that will last during events, nights out, or on days you just want to feel snatched, #FauxFilter is the foundation for you.